Generating public\/private rsa key pair. Your identification has been saved in \/etc\/ssh\/ssh_host_rsa_key. Your public key has been saved in \/etc\/ssh\/ssh_host_rsa_key.pub. Generating public\/private dsa key pair. Your identification has been saved in \/etc\/ssh\/ssh_host_dsa_key. Your public key has been saved in \/etc\/ssh\/ssh_host_dsa_key.pub. PING google.com (72.14.203.104) 56(84) bytes of data. My settings are very similar with yours except for that the network node is located at the same node with the cloud controller(nova API services). I added PREROUTING rules on compute node and I can get meta data from the compute node with the following command. Inside the instance, however, metadata server cannot be reached because I can see the following error log from the instance console log. does your instance network in same segment with controller ? could you plz post your console output on pastebin ? btw , which network mode you are using ? Here's iptalbes-save result on compute node. Console output is too long. Error stars here. If you want me to check something from the console output, let me know. but your's is Vlan , I have no idea about that . But I'm sure that's the problem on network. 3. would you like to try FlatDHCP ? I wonder to know the solution too , I believe Vlan mode will be used in my lab. I found that other people have got into the same problem. I have reported a bug with this issue. This may be the fastest way to resolve the problem. Which node did you ping or ssh on to the instance? there's no route to the instance IP. Here's route result on the compute node. Once you want to ssh instance from compute node , route compute node to instance , gateway from "nova-network host"!!!!! It was because of missing one flag. Adding the flag, it works find with the FlatDHCP mode. I'll move on to VLAN. I have nearly the same setup (see https://answers.launchpad.net/nova/+question/154362). I can SSH to VMs only from the nova-network machine. I am new to iptables. Would these make the difference? Yes , that's the key point. Iptables is very important for routing and network manage. Due to my eth0 is external NIC on nova-network, all traffic must have a outbound route , this rule means apply all NIC can route out from eth0. My Nova management network is 192.168.1.0/24 and instance's network is 192.168.2.0/24. Two networks in nova-network host , that's why you don't need any other rule for instance to communicate with Management network. For example, let's assume an instance IP 192.168.2.10. nova-network will bind 192.168.2.1 to it's host as DHCP listen address, so that nova-network host is include the network segment of instance. You can verify it by #ip addr show. But other hosts did not include 192.168.2.0/24 , how can they talk with instance ? So we need to do some tricky stuff. The key point is let other hosts to reach 192.168.2.0/24. *Apply 192.168.2.0/24 & 192.168.1.0/24 route to each other through nova-network host which is the only place include two networks. I have a question about the top illustration. By the constitution of the illustration, which range assumes that it is a DMZ(demilitarized zone)? Does the Firewall have only to locate it between Ubuntu2 and Internet? 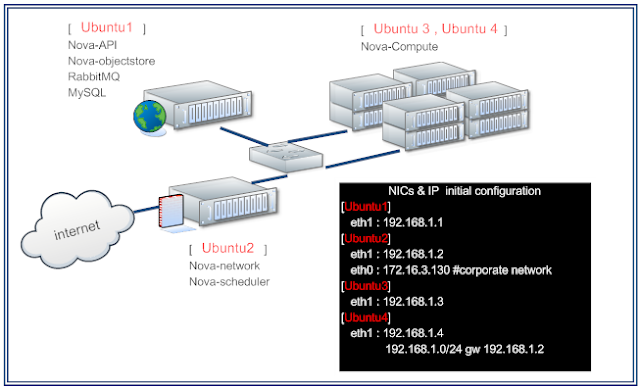 In clearly , Ubuntu 2 is the firewall between corporate network and OpenStack Nova.. It's for internal test only now. I want to know the assumption that an illustration shows. Please tell it if you have an idea. And do you want ur instance colud be accessed from external network ? I this illustration , it's possible. How will you access into Ubuntu3 or Ubuntu4? Is that matching your desire? Your answer is quite matching my desire. An intention of my question is a thing about the security. I understand what this system could be managed almost as follows. The general user who is not a cloud administrator can access only Ubuntu2 and can access VM instance on Ubuntu3 or Ubuntu4 via this. On the other hand, only a cloud administrator can access physical server(Ubuntu1 and Ubuntu3, Ubuntu4). 1. How could a normal access Ubuntu2 ???? There's no any account for a end user. We don't need to create a user who is a Cloud consumer in OS. The account info of Nova is been added in mysql DB. 2.Nova user management is based on RBAC. You can specify a role to an account. Search for RBAC on openstack.org. OS System Administrator could access any physical machiness. End user can not access any physical machine unless the user has a OS account. So it's full of security. I can understand that why you feel confusing about user management. Read more and test more. You'll know the policy. > 1. How could a normal access Ubuntu2 ???? The meaning that I said "The general user can access only Ubuntu2..." is not such a thing. I wanted to express that it is necessary to be able to transmit a packet to Ubuntu2(accepted ping, but not accepted ssh) at least in order to access VM instance launching on Compute-Node(Ubuntu3 or Ubuntu4). In the illustration , Ubuntu2 and instances are pingable. You need to set additonal iptable rule on ubntu2 for general user's nova-api request redirect to Ubuntu1. Once you do that , and download personal cert of openstack. The account could use cloud IaaS any where.